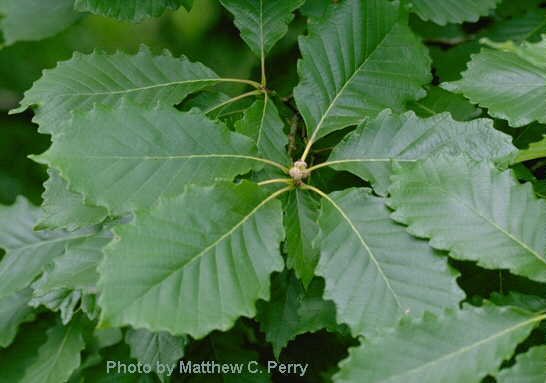 Quercus prinus.Matthew C. Perry.www.pwrc.usgs.gov. (Accessed 9/2014). Quercus montana is a tree to 30 m tall; to 120 cm dbh; white oak group (subgenus Lepidobalanus); root system of lateral roots with fine root mat near surface (not as deep rooted as white oak), roots associated with ectomycorrhizal fungi (Decker and Boerner 1997); bark dark, deep furrows with wide, flat ridges. Leaves alternate, to 22 cm long, widest mostly at or above middle, glossy green above, slightly hairy below (less than Q. bicolor), base usually wedge-shaped margin with 10-15 regular, round-tipped, narrow teeth (smaller and more regular than Q. bicolor). Fruit acorns to 3.5 cm long, usually much longer than those of white oak, nut shiny, thin shelled, tannin content of kernel low; cap 2 cm wide, covering 1/2 acorn, close fitting, Sept.-Nov., matures in one season. Seeds dispersed by squirrels, blue jays and other animals that bury acorns, Sept.-Oct. Acorns eaten by many birds and mammals that do not bury nuts (raccoon, fox) (Martin et al 1951). Gray squirrels and mice have been shown to destroy over 99% of acorns (Wood 1938). Acorns root the same fall, sprout the following spring, squirrels may cut embryo to prevent germination (Barnett 1977). 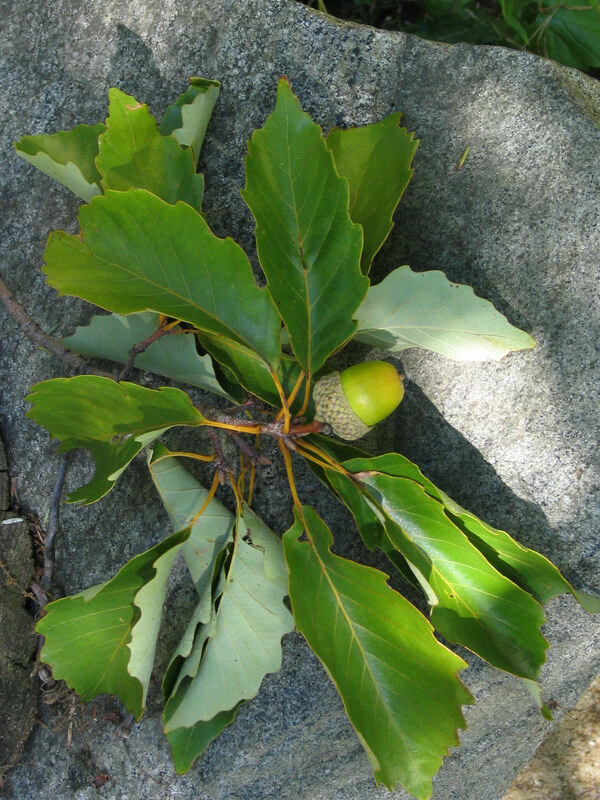 Acorns germinate and seedlings develop best under a cover of 1-2 inches of leaf litter (Barrett 1931). Seedling grows slowly. Frequency in NYC: Locally frequent. Habitat: Upland forests, generally a sign of a maturing forest on dry, undisturbed soil pH 4.5-6.5 (USDA, NRCS 2010). Grows well on relatively acidic, gneiss-derived soils (Balter and Loeb 1983). Seedlings can develop in very acid soil, down to pH 3.5 (Wood 1938). Found in soil pH 5.0 (Gargiullo unpublished data).Tolerant of salt, drought. Moderately shade tolerant, index 4-6, (similar to white oak). Intolerant of flooding, soil compaction (Hightshoe 1988). Young trees stump sprout when cut. Quercus sp. in the white oak group are generally more drought tolerant than those in the red oak group (LeBlanc 1998). Quercus prinus, bark.© Copyright Sheryl Pollock 2011.www.discoverlife.org. (Accessed 9/2014). Notes: Deer and rabbits eat twigs and seedlings, other animals eat buds (Martin et al. 1951). 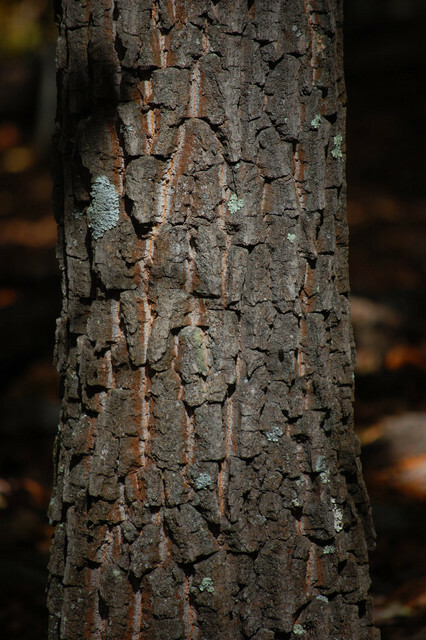 Susceptible to fire damage that allows entry of fungal infections such as twig-blight (Diplodia longispora), and cankers caused by Botryodiplodia spp., Nectria galligena and Strumella coryneoidea. It is a preferred host of gypsy moth (Lymantria dispar) and is attacked by the Colombian timber beetle (Corthylus columbianus) among others. Acorns are attacked by weevils (Curculio sp.) but are less susceptible than those of other oaks (Burns and Honkala 1990). Foliage eaten by the banded hairstreak butterfly, Satyrium calanus, (Lepidoptera, Lycaenidae), (Tallamy 2003). (See Q. alba for other insect predators).